On saturday people took the streets in Göttingen, Berlin and Bonn to protests against repression and the raids against NoG20 protesters earlier this week. A short report from the demo in Göttingen. Image: A black bloc at the front of yesterdays demonstration against repression in Göttingen, Germany. Image by LinksUnten Göttingen. Published by Enough is Enough. Partly translated by Enough is Enough from LinksUnten Göttingen. Read all our NoG20 reports; here. After the wave of police raids in several Germany states against alleged NoG20 activists on Tuesday December 5, there were several demonstrations in Hamburg, Berlin, Freiburg, Neumünster and other cities on the German territory earlier this week. On Saturday people took the streets again. 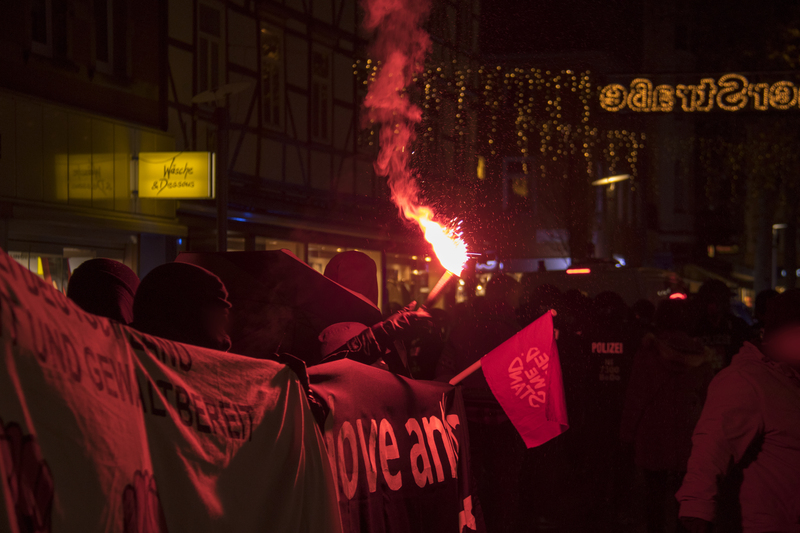 In Göttingen about 650 people took the streets. The demo started in front of the self-organized house project OM10 at the Platz der Synagoge. Image: Bengal flares during the demonstration in Göttingen, Germany. Image by LinksUnten Göttingen. After a few speeches, one of them by somebody who was one of the targets of the police raids on December 5, the demo started marching. At the front of the loud and angry demo was a masked black bloc. About 650 people marched through the Untere-Masch-Straße in the Goetheallee. The first quarrel with the cops broke out at the Papendiek turnoff, because the demo did not turnoff but went straight into the Prinzenstraße. The demo continued marching through the city center. After a speech at the corner of Rote Straße/Jüdenstraße the cops violently stopped the demo. They kicked and hit the first lines of the demo with batons. One of the stewards (In Germany the cops demand stewards at registered demos) was violently detained during this police attack. The steward was dragged into a police car while he was aswoon. The cops refused medical treatment and the car drove away fast. After support with bengal flares the demo ended at Albaniplatz. The front block of the demo spontaniously decided to try to march to the police station at the Groner Landstraße to wait there for the detained steward. The cops prevented this spontaeous demo and violently stopped the march. After a few minutes the cops retreated and the demo ended. A little bit later a small group of activists appeared in front of the police station. The arrested steward was released again in the early evening hours. On saturday, people in Berlin and Bonn also protested against the NoG20 police raids.